Everything depends on the size of the crowd that shows up. If it's small we can camp at the place we camped the first meet. That ones easy. Last year I marked 2 large and wide open areas just down the road. S-2 or S-1, I cant remember, but they're on my GPS and I can furnish the coordinates. Not much protection from the wind (yeah, like that really matters!!!) I get there on Thursday in the morn ing, and so does Mike. Hey Camp Director (That's U Joey) you need to get organized and tell us buffoons what to do!!! Farts are just ghosts of the things we eat! We'll be there .... most likely on Wed or Thur. So.... It Would be nice ifin we had a sudoe location picked out before then. Look forward to seeing everyone again. Hey Andjello! Long time glad your gonna make it. I will try and find a spot on google earth for a few suggestions. Last few meets we had a great turn out and had to go 2 circles, also the last Dove Springs spot was too small also and had a gazillion nails. How about the Staging area?? Looks like 2 good size areas that you early arrivals can secure?? Of course I dont know if those are hillsides looking at google maps. Mike would know better, but I think that area is all incline as it goes up to the hill. If you keep going down the aqueduct road a few hundred yards, that was where I was talking about. Some on the left, but mostly on the right. Tomorrow I'll try and remember to get the GPS out and post the coordinates. 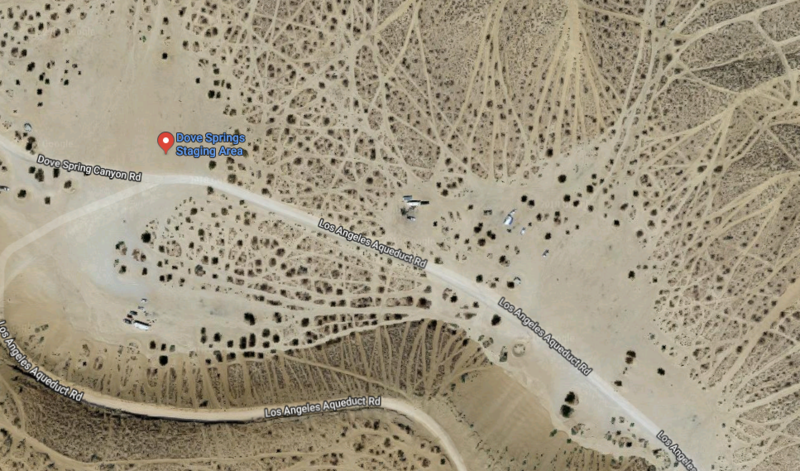 The second one (I believe) is the Dove Springs camping area we stayed at the first time. The first one is down the road a short ways, and there are massive open areas on this road that can handle any size group in many different areas. Both are an easy drive to get to. I have not camped in Dove Springs in a long time. Last time we entered on the main road and hung a right on I believe LA1. It is a graded dirt road. you have to climb a small hill and go past a a cattle crossing and then there are lots of large flat areas to camp. Is this where your first location is located? I'm going to try and join you all. This is my weekend / day trip area so we go all the time and have a ton a fun and cool routes. Just did a 70 mile loop never touching the same path, with plenty of beer "historic" stops. For large groups the AQ road is best and super easy for all to get to. I'm obviously not an expert on this area, but I thought the large flat areas were B4 the cattle grid. I just remember taking Dove Springs exit all the way down to the bluffs (that's what I call them). On he left is where we camped the first time. Since the road ends here, ya veer right and only a couple hundred yards down the road (Aqueduct Road? LA1? LA2? , I dunno) are HUGE open areas that would hold hundreds of rigs. Since I don't know squat about this area, I think I'll back out of the conversation and defer to those more knowledgeable about the area. Hey Mike,,,,,hint hint. Or Dune Track-N,,,,another Hint Hint. Just don't trust JBL. He got lost last year!!!! I have not camped there in a very long time. I just remember crossing a cattle crossing after going up a graded dirt road. We camp in Jawbone or Cal City usually. Thank you Dune for posting this and look forward to meeting new folks. If I recall, the 2 areas tightly circled are on a slight hill. And if my old memory serves me, the three other spots DuneTrak circled looks good and relatively flat! So my money is on any of those 3 spots. So between SS and Anjello, please secure something and post up asap. Unlike Jawbone, Dove springs will have cell signal. And SS if your down to check out the brewery, perhaps we can just get that ride done Friday. Im shooting for a late night Thur or very early Friday arrival. You are 100% correct in your assumptions. The first red circle on LA1 (right at the cattle guard) is probably the worst for nails, we started camping there 12years ago and it was bad. Now we camp at the heart on the map, but that's only good for about 10 rigs. The two in the middle should be the ones to get, with the middle/middle one being the best on the west side of the road. This is the one we scouted last WWW.. This area is also good for large groups..
We'll be there on Thursday mid-day 'ish, +/-, there about. A ride to any brewery sounds great! We're in. I am still in but maybe just riding shotgun. Car goes under the knife next week, motor is coming out. If they get it fixed in time, car will be there. If not, I'm riding with CRAWLR in the Speedcat!!! They have a month and a half to do 3 days work! Call those jackasses every day and tell them to get on it!